She was a devout Christian and a member of Columbia Baptist Church. She was a respected community, business, and civic leader, and was the matriarch of prominent Adair County family. She was retired from IMO Delaval pump division in Columbia, KY, and was a member of the VFW Auxiliary. 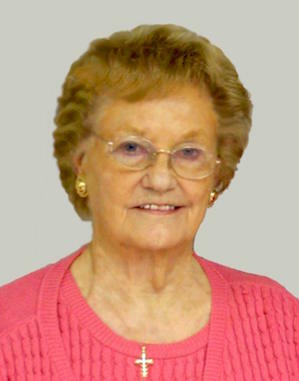 She was an avid golfer, and was former President of Pinewood Country Club. She was the daughter of the late Benjamin Harrison Bradshaw, Sr., & Mallie Blakey Bradshaw, and the widow of Arnold Mayse. She leaves eight direct living descendants spanning four generations. McEva Mayse age 91 years of the Glensfork Community in Adair County, KY passed away Wednesday, March 28, 2018 at 4:17amCT, at her home. Funeral service Friday, March 30, 2018 at 11amCT, at Stotts-Phelps-McQueary Funeral Home, 210 Greensburg Street, Columbia, KY, with Bro. Stanley Watson the officiating clergy. Interment in Haven Hill Cemetery, 1276 Liberty Road, Columbia, KY. Visitation will be 4pm-8pmCT, Thursday, March 29, 2018, and after 6amCT, Friday until time for service. She was born on December 23, 1926, in Adair County, KY. She was the daughter of the late Benjamin Harrison Bradshaw, Sr., & Mallie Blakey Bradshaw. She died in Glensfork, Adair County, KY, Wednesday, March 28, 2018, at the age of 91 years, three months, and five days. She was preceded in death by her husband Arnold Mayse on November 5, 2010, and by the following brothers & sisters: Irving Bradshaw, B. H. Bradshaw, Jr., James Willis Bradshaw, Anna Rose Collins, Lizzie Nell Coffey, Lucille Blakey and Louise Hubbard. McEva was a member of Columbia Baptist Church, retired from IMO Delaval pump division in Columbia, KY, was a member of the VFW Auxiliary. She was an avid golfer, and was former President of Pinewood Country Club. 2018-03-28 - 210 Greensburg Street, Columbia, KY - Photo from Stotts-Phelps-McQueary Funeral Home.